Continuing on from Part 1, here are my essential summer picks as well as my favourite body and hair care products. Enjoy! Throughout the summer there is always going to be those items that you keep coming back to because you can rely on them to do what they say and do it well. This group of products have been exactly that for me and I couldn’t have get through these hot days without them. DRUNK ELEPHANT – UMBRA SHEER PHYSICAL DEFENSE SPF 30 $38 I cannot even begin to tell you how thankful I am for this product. Last summer my face was a complete mess because of the sunscreens I used. They were so horrible for my skin and I was so unhappy. Once summer was over I stopped using them and living in LA, that is not good at all. I just couldn’t bring myself to use sunscreen anymore, which is why I am so in love with this product. This is the best sunscreen I have ever used and I can happily use it every day even though it is 20% Zinc Oxide. The ingredients are amazing, the brand itself is incredible (all their products are strictly free-from) and when I wear it my skin looks semi-matte but still glows. It’s more like skincare than sunscreen and I cannot recommend it enough because there is no grease, residue or white cast. LAVILIN – UNDERARM DEODARANT CREAM $17 Finding a great, free-from deodorant is not an easy task and I tried so many before I stumbled upon this one via Conscious Beauty. I was so happy to find that it actually worked for me and while it won’t stop you sweating (I’m 100% OK with that) it will stop you smelling like you’re sweating. The packaging is not great (as you can see, mine has cracked) but I can attest to it’s effectiveness as it has kept me smelling fresh, even after 2 hour long Runyon Canyon hikes in over 90 degree weather. It’s aluminum and alcohol free and they say you only need to apply it once a week but in the summer I do use it every day just to be safe. NUXE – REVE DE MIEL LIP BALM $19/£9.50 This lip balm is one of my favourites and I love using it in the summer because it is deeply nourishing and reparative without being greasy or leaving my lips feeling slick or sticky. It has such a lovely honey/orange scent and the matte finish means it works well under lip products. This is so helpful if your lips get chapped and burned from the sun and I slather it on every night before bed and when I wake up my lips are plump, smooth and hydrated. BALANCE ME – WONDER EYE CREAM £20 (mini is £11) It is very rare for me to like an eye product but I really like this one and have been using it consistently for the past few months. 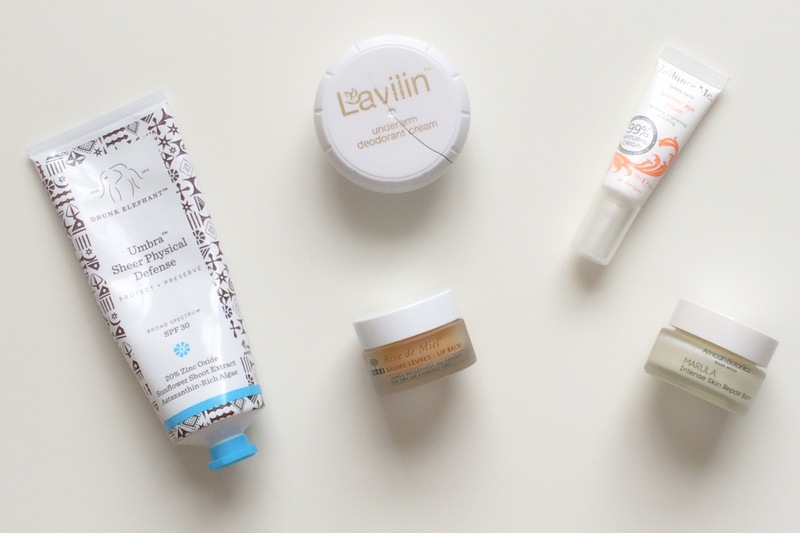 It might seem pointless to use eye cream in the summer but you really should. The skin under your eyes is a lot thinner and therefore more vulnerable to the sun’s harmful rays. I like this stuff because it’s really gentle and doesn’t irritate my eyes and I can definitely feel a firming effect when I apply it. AFRICAN BOTANICS – INTENSE SKIN REPAIR BALM $55/£40 This is such a great product if you are prone to burning because it is so healing and soothing. It helps the skin to regenerate quickly, calms inflammation and reduces redness. This balm will make sure your skin doesn’t become all dry and crispy from the sun and will also prevent any burns or redness from turning into discolouration. This is my year round secret weapon and has saved me in all kinds of countries and climates. 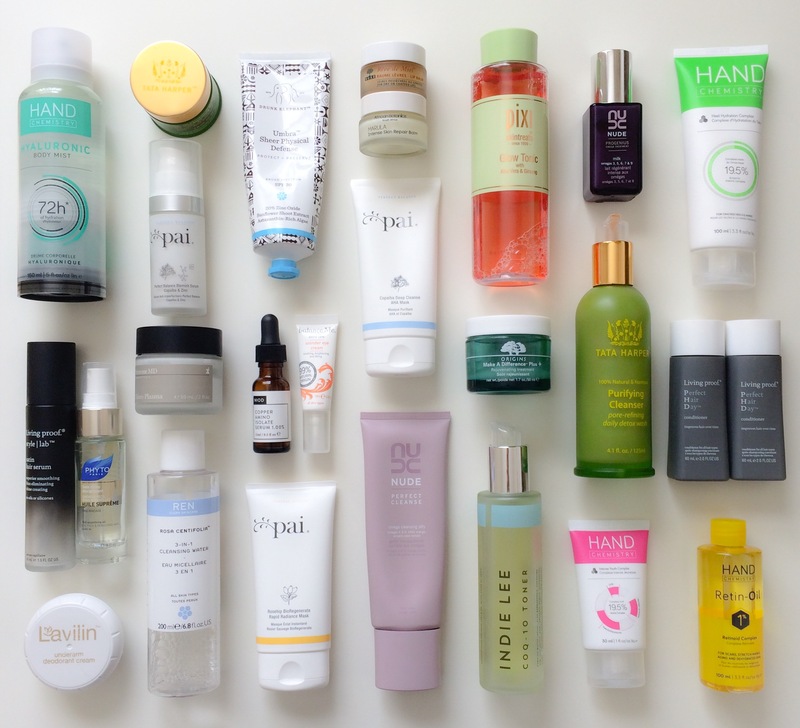 As you can see from the picture, there is one brand that has taken over my body care section and I am not mad about it at all! 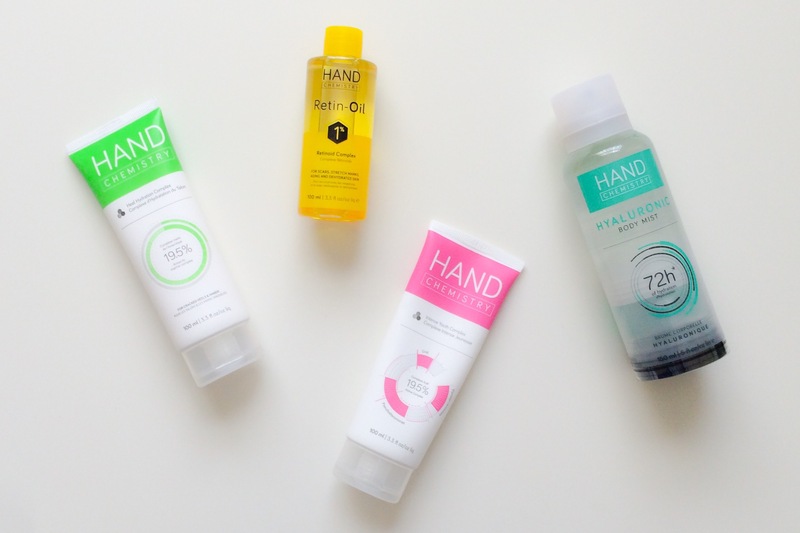 Hand Chemistry is such an innovative and impressive brand and each product here has been an absolute favourite this summer. HAND CHEMISTRY – HYALURONIC BODY MIST $20/£17 This incredible body mist should be a summer staple for EVERYONE. Yes, I mean it that much! It is such a quick and easy way to hydrate your body and the product itself is so light and refreshing (it has a mild lemon scent) so it is the perfect way to cool down after a shower. The continuous mist is fine and even and you can use the bottle upside down and still get the same great application. I use this every morning and my skin so soft, smooth and nicely hydrated without any greasy feel or residue. HAND CHEMISTRY – YOUTH INTENSE COMPLEX $20/£19 AND HEEL HYDRATION COMPLEX $15/£15 These two are such an essential duo for keeping your hands and feet smooth and soft and most importantly, blemish free. In general, our hands and feet take a battering and in the summer any cuts or scraps are likely to turn into pigmented scars because of the sun. Both of these products do way more than just hydrate and tackle brightness, texture and evenness to keep both hands and feet looking and feeling their best. HAND CHEMISTRY – RETIN-OIL $20/£20 This has to be one of my favourite products from Hand Chemistry because it is so genius. Why wouldn’t we want to use Retinoid (an anti-aging wonder ingredient) all over our body?! Warmer temperatures mean more skin on show and this oil will make sure the skin you bare is the best it can be. Just like the Retin-A/Vitamin A we get in our skincare, this dry body oil, which smells delicious (think tropical/beachy/fruity) will hydrate, smooth, brighten and fade scars (it will even get to work on stretch marks! ), giving you incredibly soft, smooth, even skin. I use this oil every other night before bed and I love how my skin looks in the morning. This is the only category to have stayed the same since last year which really says a lot about these products. For me, over the summer I want to make sure my hair is hydrated, smooth and feeling as clean as possible for as long as possible. I hate washing my hair too often and especially when it’s hot, I cannot deal with heat styling, so anything that helps me avoid that is a winner. 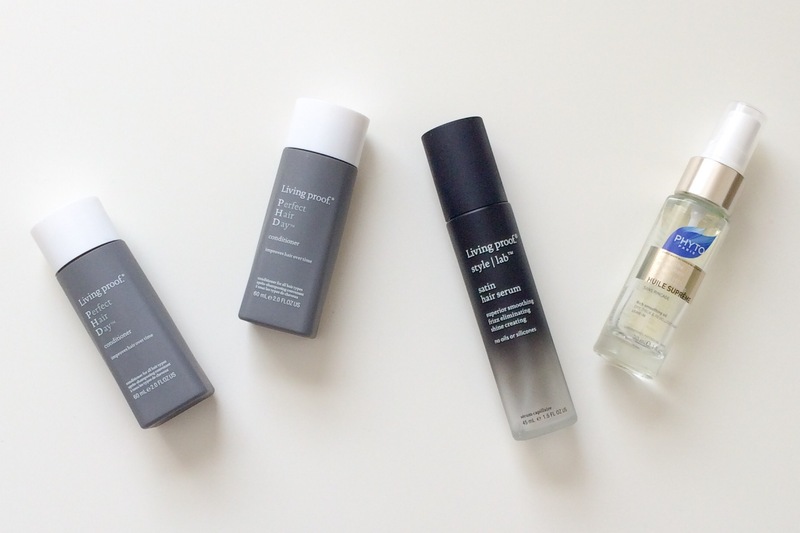 LIVING PROOF – PHD SHAMPOO AND CONDITIONER $50/£40 When these two launched last summer they were an instant hit and I have been using them ever since. They make my hair look great and most importantly feel and look clean even after I have sweated my way through Runyon or spent the day at the beach. My hair looks better for longer which allows me to be low maintanence and with long hair that’s exactly what I’m looking for. They are both sulfate, silicone and oil free which makes them an excellent option for anyone with colour or chemically treated hair. LIVING PROOF – SATIN HAIR SERUM $29 Another product I discovered last summer (and have been using ever since) is this hair serum and it is one of the best. Like the shampoo/conditioner, it is oil and silicone free and I absolutely love that about it because it means you won’t get that horrible “build-up” feel in your hair. I use it to smooth frizz and create some shine and it feels weightless in my hair which is perfect for when it’s hot out. PHYTO – HUILE SUPREME RICH SMOOTHING OIL $40 Sometimes, after a long day in the sun or in the water/pool my hair will be crazy dry and hard and not even my Living Proof serum can fix it. When this happens I always reach for this oil because it is so nourishing and smoothing and makes an instant difference as well as providing long term repair. I only apply it to the ends and mid-lengths, as it’s quite heavy but unlike most hair oils, it is silicone free and 99% botanical. So, that concludes my summer favourites! I hope you enjoyed reading about everything I have been loving lately. This was just a general overview of everything and full reviews on almost all of these products will be coming over the next few weeks. Until then, if you have any questions about any of these products, please feel free to ask me. I would also love to know what’s been helping you get through the summer and any products you think I should try!